First, open the Restore Messages from MightyText app on your phone. Next, tap Choose Account and select the Google account that is linked with MightyText. Next, follow the steps on the screen to unlink your Google account in the main MightyText phone application. Next, tap Restore Messages and choose how many messages you’d like to restore. If you’re running Android 4.4 or higher: Follow the prompts to change your default messaging app to MightyText (temporarily) and then messages will start restoring from MightyText to your phone. 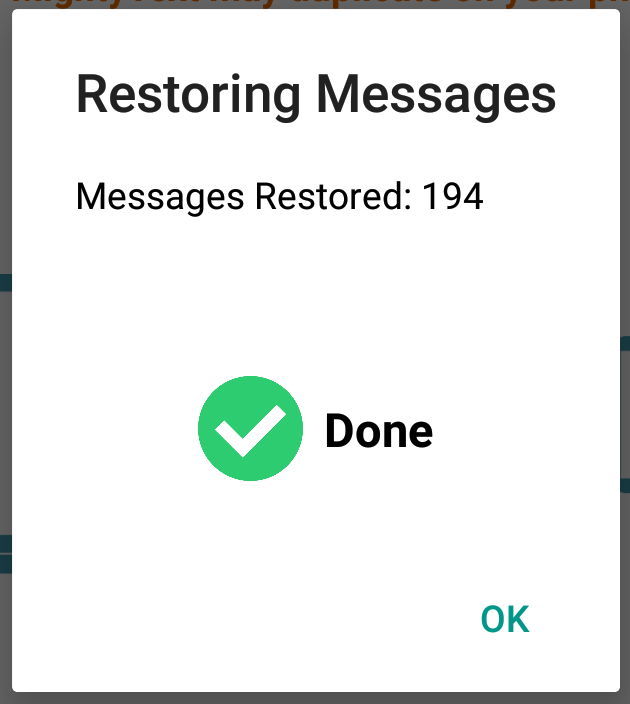 Once complete, you should see the number of messages restored. Tap OK, and you’ll be prompted to change your default SMS app back again. Finally, launch the main MightyText application on your phone and re-link your account. Note: if you have messages on your phone which were previously synced to MightyText, those messages may duplicate.